Personal Knowbase is an easy-to-use freeform note-keeping program for Windows. Collect all your scattered notes, lists, ideas, and clippings into one information repository. Organize them with bookmarks, dates, and keyword tags. Need easy but powerful note-keeping software? Reduce paper clutter in your workspace by entering notes in organizer software. Record thoughts quickly without having to navigate deep data trees. Handle 1000s of notes easily. No limits on number or length of records. Personal Knowbase is a better way to store your miscellaneous notes and keep your random snippets of information easily accessible. You can be an information packrat and never worry about losing a note once you organize it with this flexible notes manager. It's like note-taking in an indexed digital notebook. Capture your thoughts and index them by tagging with keywords. Use the keyword index for quick access by filtering your database for related information. While browsing the web, when you run across that fact that you know you'll need later, copy it into Personal Knowbase and know you'll be able to find it when you need it. Or just store a link to the web page for later reference. Cross-reference your notes with hypertext links between entries. Keep all your information for one project together by linking to external files and Internet addresses. With Personal Knowbase, you can also add reminders to notes so that an alert pops up at a specified date and time. Remind yourself about appointments, project milestones, and due dates. 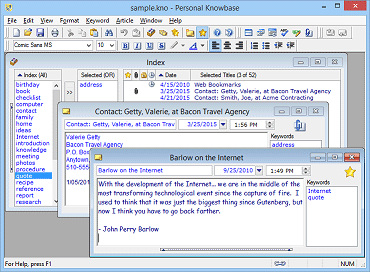 Get Personal Knowbase Note Management Software Today! Note-taking on the go. Run Personal Knowbase from a USB drive on any Windows PC.